1 sq. ft. of 12 in. x 12 in. 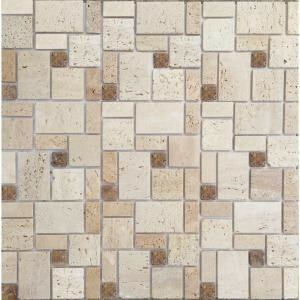 Natural Stone Wall Tile - Instant Mosaic tiles add a luxurious touch into your kitchens, bathrooms or feature walls. Visually striking design. Easy to install: just peel and stick. Superior adhesion on most flat, dry and free of dust surfaces. Tiles can be applied over drywall or existing tiles. Suitable for traditional, contemporary or transitional rooms. Wet saw recommended to cut this tile. 1 square foot per piece, each piece sold individually. Piece weight equals 2.2 lb. Buy online Instant Mosaic Peel and Stick Natural Stone 12 in. x 12 in. Wall Tile EKB-04-107, leave review and share Your friends.